CEPO would like to take this opportunity to appreciate the individuals who helped in verifying the violations presented in this report. Specially thanks goes to the warring parties’ military spokespersons for speaking publicly through the available media. This demonstrate their commitment for peace to prevail in the country. Great appreciation for the quoted media houses in our report, your article has enriched our report content. Thanks also goes to CEPO staff who made this report available for the public. The signed Cessation of hostilities agreement between the government of South Sudan and the warring parties has witnessed serious violation at its early stage before it could last for a month from the date of its singing. For the agreement to hold, all parties and signatories to the should demonstrate the will to implement it. Good and appreciative messages were delivered by the leadership of South Sudan Defense Forces, SPLM/A-IO under Riek Machar and the National Salvation Front (NAS). The best approach for making peace and stability to prevail in South Sudan is the change of attitude by the warring parties. It is time to use nonviolent political approach to resolve the political difference among the warring parties. The spirit of revitalizing the cessation of hostilities is great and nationalistic that needs to be maintained by respecting and implementing the the signed agreement. The recently observed violations require urgent verification and investigation by IGAD through its designed mechanism of CTSAMM. Donor community and UNMISS role is critical in facilitating CTSAMM at this point since the cessation of hostilities is an approach of creating trust and confidence for revitalization of the Agreement on the resolution of conflict in South Sudan (ARCSS). Its failure in the month of January 2018 will offer great risk in February 2018 revitalization sessions. AU head of states and Government should come out with strong implementable resolutions on the fate of the cessation of hostilities and IGAD-led ARCSS revitalization forum including actualization of RPF. The violations documented in this report should be independently verified, monitor and reported by CTSAMM before AU Summit which is due in January 2018 for decisions making. The parties to the agreement should effectively cooperate with CTSAMM during the verification and monitoring exercise. The implementation matrix of cessation of Hostilities agreement is not so specific on matters of buffer zones and purposes including humanitarian corridors. Since these are key matters in permanent ceasefire arrangement, they need to be addressed since it’s a great gap that will offer chance of further violation if not addressed immediately by CTSAMM and IGAD. IGAD should be pro-active on matters of violations as silence never help and often contributes for public loss of trust and confidence on the fate of the cessation of hostilities. The recent statement issued by the chairperson of IGAD council of ministers was good though late. The civil society and media should be pro-active in disseminating the cessation of hostilities agreement to the public including the army. Civil society and media play greater role in sustaining public trust and confidence on the cessation of hostilities. The observed individuals who are effectively engaged in propaganda and hate speech in the social media platforms should desist from that for the interest of peace since it is one of the prohibited acts by the cessation of hostilities agreement. GOAL: Enhancing provision of check and balance for the parties to the cessation of hostilities compliances. OUTCOME: This report findings will make the parties to the cessation of hostilities bond with required compliance per the provisions of the agreement. a) On 23rd December 2017: The forces of the Sudan People's Liberation Army - In Opposition (SPLA-IO) led by the First Vice President Taban Deng Gai ordered his troops to observe South Sudan humanitarian truce. c) On 23rd December 2017: The leader of the SPLM/A-IO Dr. Riek Machar ordered his forces to cease any form of aggression and observe the cessation of hostilities agreement signed in Addis Ababa. In a letter addressed to all units, Dr. Machar says they should remain in their bases in adherence to the agreement. g) On 27thDecember 2017.The Chief of defense of forces of South Sudanese army Wednesday has pledged to implement the ceasefire agreement, urging the international community to restrain rebel forces. Gen James Ajonga Mawut, currently in Aweil for Christmas break, told officers and soldiers that President Kiir had given instructions and orders for a ceasefire to be implemented immediately. The above noticed statements from the leadership of the some of the warring parties are great because it strengthens compliance of their ground forces to the provisions of the cessation of hostilities. Such public statements from the leaders have to be regular and consistent for keeping their ground forces aware that cessation of hostilities is important at whatever situation and should be respected and observed by them on the ground. The military leadership of the warring parties should keep on making regular instructions and directives to their ground forces command to distant themselves from provoking their opponents. The chances of ground forces or single soldiers causing provocation of opponent is high especially if their essential needs such as food or access to income are not catered for regularly by their leadership. Under influence of hunger, single soldiers can attempt to get food or something for raising income and the process of getting that, military confrontation may take place. Therefore, responding to the needs of the ground soldiers timely is something that needs to be solved and address as factor of deterring solders from seeking food or income for buying food. Supporters of ceasefire may need to consider that factor in terms of aiding respect and implementation of ceasefire. a) Allow and facilitate verification and monitoring of the ceasefire violations to run smoothly without obstructions. 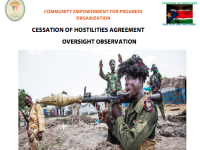 b) Positively adhere to recommendations on issues that may easy the implementations of cessation of hostilities arrangement from reliable sources that have role to facilitate implementation of ceasefire. c) Prominently holding the mechanisms tasked to support and verify implementation of ceasefire arrangement accountable to their duties and responsibilities timely without any given pre-condition. The anticipated challenge is if the leadership of the warring is not keen in making public statements that hold their forces or mechanism for implementation of ceasefire accountable. the possibility of the ceasefire facing natural death is eminent. In the situation of South Sudan, the regional protection forces should be utilized strategically and maximally to pave ways of deterring military opponent coming into contact. This means the regional protection forces should offer central role in providing protection to civilians at borders of military opponents’ temerities. Maintaining RPF as forces of separating military opponent from clashing in the name of providing civilian protection is essential. Having RPF in South Sudan context is great chance of directing national efforts towards building national security sector, because entrusting RPF the responsibility of offering civilians’ protection is giving economic benefit for the government to direct resources towards strengthening capacity and capability of security institutions for deliverance of civilian’s protection after the mandate of RPF comes to an end. Therefore, the use of RPF should be maximized for the gain of the state since its purpose is to allow the state to utilize its available resources for its future plans. Furthermore, CTSAMM is another mechanism that needs to be made functional and utilize to the maximum in playing role of deterring violations of cessation of hostilities. It does not make sense for CTSAMM to be only focusing on verification and monitoring without contributing to deterrence of violations. CTSAMM should play great in deterring violation by increasing awareness among the military population and civilians on the duties and responsibilities of safeguarding respect and observation of the cessation of hostilities. A good community partner for CTSAMM is the civil society in at its nature. CTSAMM designing joint strategy of work with civil society for deterring violations of the cessation of hostilities is paramount. The warring parties’ leadership should insist on this element because it is for their benefit in terms of being mechanism for passing their leadership compliance calls in form of statement made to the rest of the public far from being reached by the leadership of the warring parties. On 24th-25th December 2017: Logobero and Lujulo: SPLA-IO attacked the Government positions as a strategy of gain9ng these locations before the ceasefire matured or take serious implementation. Number of civilians were displaced. On 25th Dec. 2017: Kajo-keji: SPLM/A-IO rebel deputy spokesman Paul Lam Gabriel has accused the government forces for violating the Cessation of Hostilities, attacks happened in Ngepo County, Gaderu, Kansuk in Kajo-keji. Lam said fighting starting on 24 December evening till 26th December 2017. And he blamed the government forces for attacking the bases of opposition to gain control over territory. On 25th December 2017: Kansuk, Lokbere, Koch, Amadi, Awiel East, Fashoda: Government army SPLA spokesperson Brig Gen Lulu Ruai Koang issued a statement accusing the rebels of carrying out attacks on the government forces in five states: Yei River, Northern Liech, Amadi, Awiel East and Fashoda, in the last 24 to 72 hours (24th-25th December. 2017). "The rebels had stepped up offensive operations against SPLA’s positions in futile attempts to capture new strategic areas before IGAD peace monitors could embark on field visits," said Koang. On 26th Dec. 2017: Koch: SPLM/A-IO rebel deputy spokesman Paul Lam Gabriel said in a statement that at about 13:00hrs, the Juba regime forces launched another attack on SPLA- IO position in Bieh Payam in Koch County. They burnt down the base and its surrounding villages including food stores of both local produces and WFP provided donations to the suffering civilians of Koch county". On 25th December 2017 early morning: Raja: Government Army spokesman Lul Ruai Koang said four aid workers from the French organization Solidarities International had been kidnapped a day earlier by rebels near the western city of Raja. The organization said on Monday it had lost contact with three members of its team on Saturday. On 27th December 2017: Guol, Koatpadaang, Kuleer: SPLM/A-IO rebel deputy spokesman Paul Lam Gabriel said in a statement that on 27/12/2017 government forces also burnt Guol, Koatpadaang and Kuleer Villages in addition to the above-mentioned areas". On 28th Dec. 2017: Mundri: SPLM/A-IO rebel deputy spokesman Paul Lam Gabriel said the morning of 28/12/3017, government forces dispatched more than 300 soldiers from Mundri to go to attack our bases in Bari, Madewu, Ladingwa and Bangalo again. A part of the team went to Gori Balawu in Mundri West county an area controlled by the SPLA/M- IO. They are now looting food items and burning houses after civilians have escaped into the bushes". a) The will to implement the cessation of hostilities agreement. b) Maintain messaging for compliance of their ground forces. c) Offering leadership for unrestricted facilitation and promotion of the cessation of hostilities agreement by partners including civil society and media. The observed positive messages from some of the warring parties to the cessation of hostilities leadership are appreciative and should be maintained because it plays a big role in winning the public trust and confidence. These message keep the public hopeful to the idea that things may work out in nearest future for their benefits, especially in February, 2018 the second round revitalization will be taking place in Addis Ababa. Each actor being party or signatory to the cessation of hostilities have to timely start contributing in making the cessation of hostilities materialized. Finally the forthcoming AU Head of States and governments in late January, 2018 should have strong make resolution on the following demands; ensure that the signed COH agreement of December 2017 is respected and implemented; ensure that punitive measures are taken against any party that violates COH agreement; ensure unrestricted civic space and humanitarian access; support memorialization as means of deterring future armed violence and reconciling communities and ensure success of the next IGAD led revitalization forum. AU Commission chairperson should remain vocal and push IGAD/CTSAMM and UNMISS to avoid silences and increase timely information delivery on matters of cessation of hostilities violation. South Sudan leaders at their various capacities should regularly send out positive messages to the citizens and the soldiers. Voices of leaders have Hugh influence and implications. Civil society and media should be allowed to play the big role in communicating positive messages to the citizens without restrictions. See the impact of the media in framing this report content. Low public governance structures of the parties to the cessation of hostilities required to play role in raising awareness on respect and implementation of the cessation of hostilities agreement. It was impressive to see state minister of Health and Environment like of Yei River State calling upon warring parties for unhindered humanitarian access in the state. The link between the cessation of hostilities and the next peace revitalization process is critical. Since the cessation of hostilities is a step of building trust and confidence for the Feb. 2018 peace revitalization, is essential that all parties and signatories to the cessation of hostilities dedicate will, time and funds for implementing the cessation of hostilities smooth. Finally, the statement issued by chairperson of IGAD Council of ministers was remarkable but it should be beyond words especially in relation to holding violators accountable, materializing RPF and making CTSAMM and UNMISS effective in monitoring the situation on the ground and delivering timely message to the leadership of the warring parties and IGAD.